TheRecordXchange (TRX) recently launched its industry-first, certified Recording Agent™ deposition service available exclusively from TRX. Concurrently it released its “QuikText”-branded speech-to-text offering which is included as part of the RA service. However, early market feedback has shown that there is some misconception that the text is positioned as a replacement for certified transcript which it is not. The value of the text is realized with the combination of the synced audio. So, we decided to re-brand the offering to VoiceCopy to highlight the significant value of the combined text and audio. It’s a play on words since the reviewer gains access to a “copy” of the “voice” recording along with “copy” (text) of the spoken words from AI-generated speech-to-text technology. The power of dynamically linked audio to text cannot be understated. 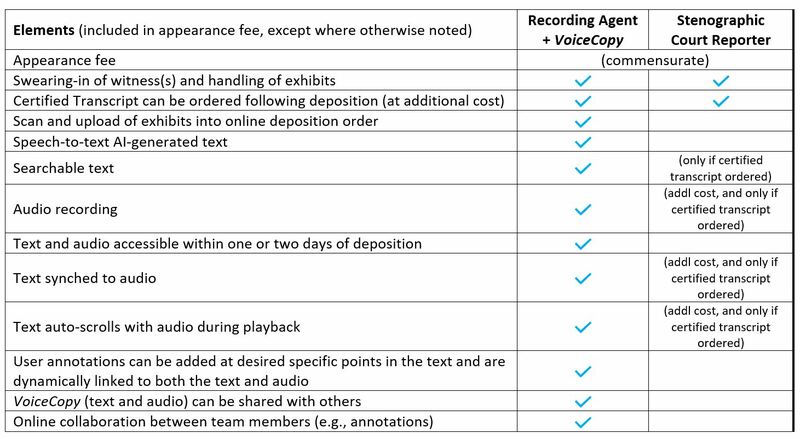 For purposes of review, the text included with VoiceCopy on its own has limited value over certified transcript. It’s not “verbatim”, with an accuracy sub-100%, even though it is fully searchable and fully viable from a textual standpoint for producing a deposition summary. However, the fact that it’s synced to the included recorded audio of the deposition makes the combination of the text and audio unquestionably effective as a more powerful research and review tool. Certified transcript strives for 98% accuracy and it is strictly a representation of what the Court Reporter believes they heard and is undeniably subject to human error. Having access to the actual recording gives attorneys the ability to listen to the voices and determine for themselves what was said. Further, being able to hear how something is spoken holds much inference value that can help direct future discovery. Finally, the text acts as an effective navigation tool for quickly locating specific areas of the audio that can then be played. Attorneys simply do not have the time to listen to the recording of a deposition from start to finish. It is for this reason that certified transcript continues to be relied upon as the fundamental review medium. But with the advent of text generated from speech-to-text technology which is synced to the audio of a deposition, the review of audio is viable and arguably more effective than text alone. Having rapid access to both text and audio of a deposition holds significant value. “Time is money” is no more applicable in any industry than it is in the world of litigation. Very often, deposing attorneys do not have time to wait for certified transcript before completing deposition summaries or to prepare for the next deposition or court hearing. Further, attorneys know that the faster they can get to either a settlement decision or invoke additional discovery, both predicated on review of existing discovery, is critical. Having both text and linked audio available within one or two days of a deposition not only results in higher quality decisions but can lead to significant cost savings in lower numbers of certified transcripts ordered. Contact TheRecordXchange today to see how we can help you Take Charge of your depositions! !